Prepare to hear the name Eddie Redmayne A LOT in the upcoming weeks. With award season right around the corner, the race at an all time high! Redmayne is currently on a streak of nominations after stealing lead actor nominations for both the SAG and Golden Globe Awards. If you have not had the chance to see him star in The Theory of Everything, you are really, REALLY missing out. The Theory of Everything tells the tale of Stephen Hawking. Hawking is one of the most brilliant scientist of his generation. His story is impressive and unlike any other. The film starts off in Cambridge just as Hawking begins to study for his PhD. While taking a break from his studies, he attends a school function with some friends. His quirky and awkward antics land him a date with his future wife, Jane (played brilliantly by Felicity Jones) and together the two of them begin a journey to find their own theory of everything. Shortly after Jane and Stephen begin dating, Stephen’s body begins to fail him physically. He tries to ignore it and continue on with his studies, yet to no avail it does not go away. He starts to become sluggish and has trouble controlling his muscles. Everyday movements become a major struggle. After suffering a serious fall, Stephen learns that he has motor-neuron disease. This disease, he learns, will slowly deplete his muscles leaving him confined to a wheelchair. The catch however, is that the brain will remain unharmed. The bad news only gets worse when the doctors tells Stephen he only has two more years to live. Jane refuses to let the disease define their relationship and shortly after they are married. Just when Hawking’s world was coming together around him, his body was quickly falling apart. The film continues to track the major points in Jane and Stephen’s life together. They begin to start a family and Stephen works past his illness beating the doctors life sentence of two years. Stephen is continuing to challenge the time space continuum and his brain is unstoppable. His body however is failing him more and more everyday. Stephen is confined to a wheelchair and everyday tasks turn into full day events. Jane becomes overwhelmed and seeks out help, unknowingly both for her and Stephen. At first it takes a huge chip off of her shoulders, but then Stephen suffers a stoke that puts him out even more than before. This set back however allows him to find his “voice” giving him an opportunity to continue his studies like never before. This puts him on a path to become one of the greatest scientist in the world. 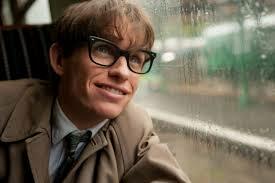 Eddie Redmayne steals the show portraying Hawking. This is pretty much his first lead actor role and after this performance it will definitely not be his last. Other notable roles that Redmayne has been in are Les Miserables and My Week With Marilyn. They were both small but noticeable roles. The Theory of Everything was not shot in chronological order, so Redmayne had to learn how to contort his body based on what they were filming that day. He also lost around 15 pounds to play Hawking and grew out his fingernails unusually long in order to get the part just right. Redmayne described the process in a recent interview with Variety. He said, “Mine were long enough to be pretty unattractive. They were a bit scratchy and generally dirty.” Hey, whatever gets you to the Oscars right!? The film, directed by James Marsh is based on Jane Hawking’s novel, “Traveling to Infinity: My Life With Stephen.” The film as a whole is a major hit. The cinematography gives a new light to the story and the score is definitely my favorite of the year. Redmayne’s next major projects is Jupiter Ascending, co-staring Mila Kunis and Channing Tatum. It will be out this summer. Right now I would guarantee that Redmayne is a lock for an Oscar nomination. I would also bet that on the night of the Academy Awards, Redmayne will be the one to walk away with the statue. Eddie Redmayne has truly given a performance for the record books.